What Is A Buyout Agreement and When Do I Need One? 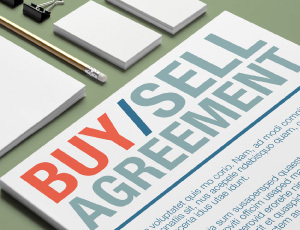 A Buy–Sell Agreement, otherwise known as a “Buyout Agreement”, is a binding contract among owners of a closely held business, which outlines the strategy and arrangement for when an owner departs the company. A buyout agreement addresses three primary issues: (1) what events trigger the buyout agreement; (2) who can purchase the departing owner’s interest in the company; and, (3) the price, or a process to calculate the value, of the departing owner’s interest. An owner may wish to depart a closely held business because of retirement, death or disability, divorce, potential default on a debt or bankruptcy. In addition, disagreements among the co-owners may trigger a desire to leave the business. As a result, a buyout agreement is typically created to ensure that the closely held business remains in the hands of the remaining owners and/or that a ready market exists for a departing owner’s interest. Further, a buyout agreement can either be in the form of a “cross-purchase” or a “redemption” agreement. While a cross-purchase agreement allows the remaining owners to buy the departing owner’s interest, a redemption agreement enables the business entity itself to reclaim the ownership interest of the departing owner. Buyout agreements are favorable in closely held businesses because they allow the owners to create a succession plan for departing owners, and to maintain continuity of the business, before any issues arise. This not only guards the remaining members from being burdened with untested or unknown successors, but also minimizes potential for disputes and stress among the co-owners caused by the uncertainty of a departing owner. Most importantly, this type of agreement can protect the objectives and interests of the business entity itself. A prudently drafted buyout agreement can be a critical tool for protecting the company’s and owners’ interests in the event of litigation among owners. However, if not drafted carefully, a buy-sell agreement can create problems as to the valuation of the departing owner’s interest or funding to enable the company or the remaining owners to purchase that ownership interest. As such, a well-drafted agreement should be periodically reviewed to avoid issues as to the enforceability of stale or improper terms that no longer meet the company or owner purposes. A buy-sell agreement is a valuable tool in business succession planning, which can provide many advantages when carefully drafted and/or reviewed to ensure that it meets the owners’ needs and objectives.